NEW YORK, May 29, 2012/ — The new Fall/Winter 2012-12 collection presented by L.B.M. 1911 centers around an informal yet sophisticated concept of elegance, strongly characterized by innovation and attention to detail. The proposed styles are expressions of the latest trends, while the materials have been enriched through traditional special dyeing, handling and washing techniques. These fabrics are manually distressed, resulting in a worn and vintage look. 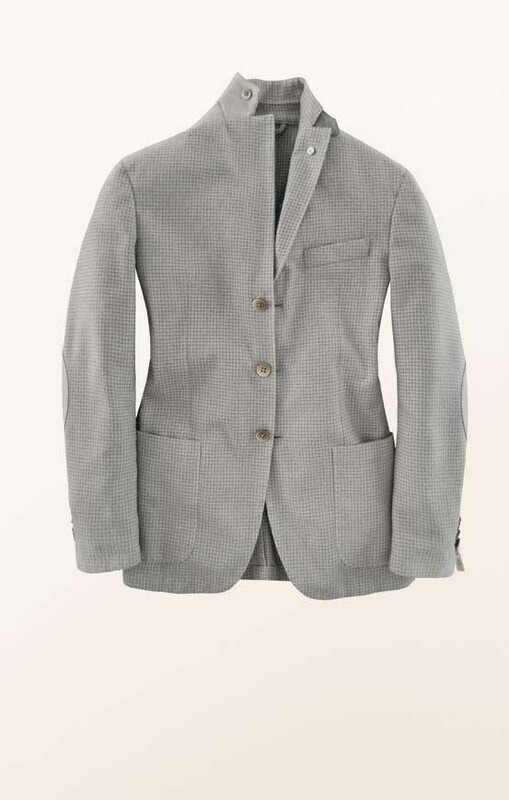 GARMENT-DYED COTTON FABRICS – The plain cottons include Moleskin (in soft shades of green, grey, blue and neutrals), velvet (non-stretch 800 corduroy with a polished effect), and very warm-textured non-stretch 400 gram satin without a shine or polished effect, befitting for jackets and suits. In addition, a 420 – gram cotton weave with a very soft, slightly warm texture and a polished cotton grosgrain is ideal for jackets and suits, as well as the trousers. The cross yarn-dyed cottons feature micro-prints, such as bird’s-eye and double-twisted grisaille. A soft-textured cotton/viscose/polyester blend is used for a micro houndstooth check and a Prince of Wales check, both polished for a warmer, textured feel. Next is a double-twisted rough cotton in three different weaves (false plain-colored): a herringbone pattern, a diagonal weave, and a cross-dyed “natté” weave. Finally, the collection features an absolutely new 100% triple-twisted cotton with an extra-fine, warm texture in close herringbone and Prince of Wales checks. GARMENT-DYED WOOLEN FABRICS – Among the garment-dyed woolen fabrics we find a wool and cotton blend in eighteen different colors; from pastels to livelier brights. Oranges, greens, and blues stand out, their bright tones enhanced by the woolen material. Prints give way to solid shades and micro patterns (micro herringbone, contrasting diagonal weaves, and micro houndstooth) for jackets personalized with contrasting patches and undercollars. Completing this line is the cashmere with a melange effect and a 100% cashmere herringbone weave. The WASHED FABRICS feature brushed wool in natural tones and shades of blue. The collection also includes garments in untreated carded flannel and a lighter flannel featuring micro patterns for both the jacket and the suit. COATS – The coats have been exclusively designed in wool. Several new models have been included in the collection—an English double-breasted coat with half-belt in flannel with a flecked-effect weave, a Savile coat with trench pockets in cross yarn-dyed wool twill, a garment-dyed wool cashmere beaver coat and a navy coat in garment-dyed sailcloth that has been redesigned with an additional 3 centimeters in length and 4 resized pockets.